Baja California is a peninsula jutting out below the American state of California and separating the Pacific from the Sea of Cortez. It has some beautiful diving, especially in Los Cabos, Cabo Pulmo and the Revillagigedo Islands. In the south of Baja the sea is warm all year round, with temperatures between 21 and 29 °C and November to March being the coldest. The visibility is best from July to October. If you go during the during algal blooms in Spring and Autumn you have a chance to see whale sharks. Manta rays and schooling hammerheads arrive during late summer and early autumn. Cabo Pulmo has been a marine reserve since 1995. A study by the Scripps Institution of Oceanography has found it to be the "most robust marine reserve in the world". Cabo Pulmo's fish species richness has blossomed into a biodiversity hot spot with tiger sharks, bull sharks and black tip reef sharks increasing in number. Ray on Gordo Banks. Photo credit: Tim Nicholson. You can do this dive from one of the dive operator's boats - but you'd be wasting your money: you can do exactly the same dive from the shore. And a marvellous dive it is. If you're the kind of person who makes lists this begs to be included in your top ten dives. A series of crevasses and abysses run parallel to the shore, mirroring the cliffs above water. The sand at first slopes gently down but at 8 m takes a steep turn. Gullies lead downwards to infinity. At 25 m you find the top of a cliff, deeper and you hang at the side of it with nothing beneath you. Sea fans decorate the cliff and shoals of chromis join you. At depths sand cascades down the rock forming the "sand falls". An excellent dive. A good plan is to swim straight out from the beach, until you reach the cliff. Then turn left along the cliff wall. From Cabo San Lucas take a water taxi to Lovers Beach/San Lucas Bay, near the arch. Make sure you tell the boatman what time to come back for you. If you wish your boatman will probably be happy to take you the scenic route, past the sea lion colony, through the arch and by the "Mexican Chickens". Santa Maria is a small bay with the best diving on the left hand side (looking out to sea). It's full of rocky gullies: be careful not to get washed up some of the narrower ones. Abundant fish, including rays and snake eels. A good shore dive for both day and night - look out for the lobsters after dark. Santa Maria is between San José Del Cabo and Cabo San Lucas. Follow the road from Cabo San Lucas until you see the Twin Dolphins hotel sign. Turn right down the track to the Santa Maria car park. Chileno is a long beach with a dive shop on the right hand side. Two rocky reefs run parallel to the beach, the furthest having a depth of around 13 m. A shore dive, it's quite a long swim out, over sand. Clumps of coral cover the rocks, harbouring invertebrates and fish. Just up from Santa Maria, sign-posted by a Snorkler sign. A shallow dive near the Palmilla dive shop. Composed of small, broad rocky pinnacles. Very interesting when you stop to look at small things. Shrimp in holes in the sand give your fingers quite a nip. Teeny hermit crab, almost as small bright blue crab, red lipped and red headed blennies. Gordo Banks is rumoured to start at around 25 m. However, this is easy to miss and the dive quickly gets much deeper. Take a torch - the water gets dark and cold. 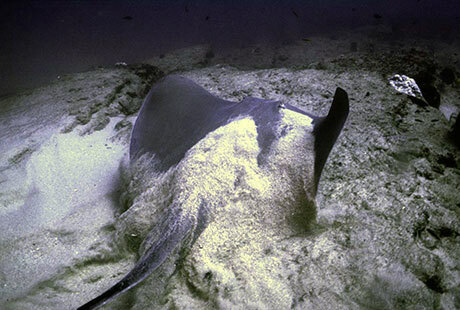 Look for sharks, morays, rays, tuna...everything twice as big as you normally see. Take a fishing boat from La Playita - maximum of 4 people - book and negotiate in advance. Alternatively use one of the dive operators. The wreck is a short boat ride away from Gorda Banks. It is in 3 parts, the parts forming a north-south-west triangle. The prop is south and big. The hull is north and upturned. If you're used to wreck diving take a torch and swim inside. The hull sparkled and was covered in fan worms with little fish peeping out of holes. A good second dive to do after Gorda Banks. Cabo Pulmo is a small village, which now has a series of bungalows in which you can stay. The only true coral reef in Baja is here, although arguably the best dive is not on the coral reef but on a rocky reef out to sea. The coral can reef-build here because of the high water temperature in Cabo Pulmo bay, which is not exposed to the cold-water upwellings common elsewhere in the Sea of Cortez. Scientists have found the marine reserve in the Cabo Pulmo national park to be "the most robust marine reserve in the world"1. People living around Cabo Pulmo, previously depleted by fishing, established the park in 1995 and have strictly enforced its no-take restrictions. Boat captains, dive masters and other locals work to enforce the park�s regulations and share surveillance, sealife protection and ocean cleanliness efforts. "I have been looking at Cabo Pulmo in Mexico for some time now and I was finally able to do it for the last 4 days. For those that don't know Cabo Pulmo is a Mexican National Marine park approximately 2 hrs north of Cabo de San Luca in Baja California. This place became known for the huge schools of Jacks that can sum to millions of fish in one school. So that was the idea when we went there. To be able to witness a school of fish that would eclipse the sun. And I can say the place delivered. Visibility was not as good as some of he National Geographic photos but still a dive of a lifetime. The photos don't give justice to the amazing experience this is. " "Iincredible diversity and abundance in a warm and clear sea"
A world class dive site - the conditions vary but all dives here are good. The reef is around 300 m long. Depending on the current, and how slowly you try to traverse it, you can spend around 20-55 minutes. The visibility is generally good. With a gentle current the dive begins with a garden of eels. Big, tight shoals of fish move over the reef - much more compact than you see elsewhere. Large schools of tuna swim overhead. Sea of Cortez really does contain more fish than elsewhere. A strong current makes for an excellent drift dive. The fish frantically zip about, swimming easily against the current. This time the schools are loose and spread out. You don't just see fish of course, coral, sea fans, starfish, crabs, etc, are all here too. Although close to the shore you need to take a boat to reach these caves, or swim-throughs. Lovely dive with several ways in and out the caves - no torch needed. Coral, sea fans and sponges cover the ceiling. Angel fish, soldier fish and squirrel fish, amongst others, freqent the area. You can dive the south end of the reef as a shore dive. Instead of going to Cabo Pulmo carry on round the road and take a small offshoot to a place where you can walk down to the beach. Snorkel out about 100 m. The vis is often bad to begin with, but gets better. There are three coral reefs (some sources say eight), but it is difficult to tell where one reef ends and one begins. The outer reef is beautiful with a carpet of elegant coral, Pocillopora elegans. The north end of the reef is a boat dive. Its east side is a cliff dipping from 5-14 m. Further east a sandy bottom slopes gradually away. The top of the cliff is a plateau of coral: very pretty. You sometimes get a current whipping across the coral, which makes for a wonderful drift at the end of the dive. For La Paz diving you need to book with a diving operator. There are not really any shore dives. Puerto Ballandra was mentioned as an option, but didn't appear very enticing. Another fantastic dive, but you have to be lucky with the conditions. The current here is unpredictable and if strong detracts a lot from the enjoyment. On good dives, you descend into a cloud of small wrasse, just inches from your mask. The visibility is at least 25 m. With luck you might see a turtle, swimming very slowly, being cleaned by cleaner wrasse. Typically of Baja, a multitude of fish live on the mount. Large shoals of jacks hang off it, and hammerhead sharks lurk in the background. Or, sometimes, in the foreground. In late summer and early autumn (fall) look for manta rays. "Long ride out but beautiful scenery : stark uninhabited mountains, dolphins, manta rays, turtles and flying fish jumping out of the water, school of pilot whales to swim with on way back plus whale shark. At site, medium to strong current and visibility max, 12 meters but a wealth of life : a giant moray eel literally behind every rock, saw more than fifty on the 25 minute dive, hammerhead sharks, barracuda and many other fish. " "Lots of rays and eels, it was beautiful! Great viz!" A very good dive. The Salvatierra is sunken ferry lying in the San Lorenzo channel between Espiritu Santo and the Baja California mainland. The ferry collided with a rocky reef and sank with a cargo of trucks, but no passengers. The 300 foot hull is intact and lies at 19 m. The mast sticks up to within 7m of the surface. The first thing that strikes you is all the yellow polyp black coral, Antipathes galapagenis. This is particularly beautiful. You can swim through the wreck and see some of the large truck wheels. Among the wrecks occupants are octopus and Sergeant Major fish Abudefduf saxatilus. "Interesting and full of life. Biggest green moray eel we have ever seen!" Two small rocky islands upon which lives a sea lion colony. The young sea lions enjoy playing with you when underwater. A shallow reef where you can see both sea lions and manta rays. The Fang Ming was a Chinese fishing vessel that was seized by the authorities for trying to smuggle migrant workers into the US. In 1999 the 56 m long vessel was intentionally sunk to create an artificial reef. It now lies at 21 m and is well-colonised with underwater life. A group of small rocky islands with a large sealion colony. "I Dived, for the first time, with Sealions. They played with the 4 of us for over an hour - I loved every minute of it! ": Hannah Chapman, UK, 2006. "The viz was not very good on this dive, but the life was amazing. They said that the viz improves at this location later on in the year. ": Hannah Chapman, UK, 2006. "I would rather dive here than anywhere in the Cortez. The Midriff Islands are full of rarely or never dived sites that are 5 star Cortez. Generally, closer to Bahia de los Angeles is lower quality though there are standouts. Plenty of easier diving that is good. Dived some of best of the W. Pacific and Carribean and though the diversity can't compare the unique species mix and undiscovered feel make it a favorite. ":Janique Esrey 2007. Sloping seamount just offshore up to 80 plus feet (best under 50). Generally intermediate unless strong current.
" Schooling fish like yellowtail seen regularly. Excellent tropicals during warmer water. Always interesting- large morays, lobster, seahorses, and frogfish. Reported up to size of small dinnerplate. Seen them as big as sandwhich plate but no bigger. ":Janique Esrey 2007. Extensive dropoffs, interspersed with NUMEROUS caves, arches, swimthroughs-all plastered with lots of intervetebrate life. Remote and expert site not advisable during height of tide cycle or when winds unstable.
" 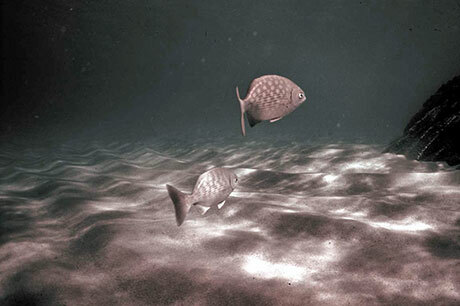 Most spectacular dive I have done in Cortez - Loreto, La Paz, C Pulmo " :Janique Esrey 2007. Deep pinncales 30 to 130plus.
" Great life. Just offshore but 30 minutes down coast. Boat fast and seaworthy but basic, a superpanga. ":Janique Esrey 2007. 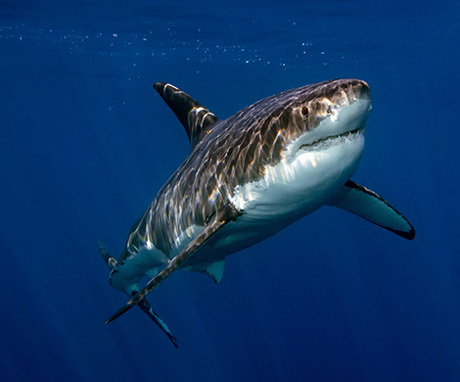 "Snorkeled with 15 whales sharks in August 2010 and 12 in September 2010." :Bob Defeo 2010. "Mobila Rays, Sea Lions, Turtles, Sperm whales, dolphins, octopus, nudibranchs, damsel fish, groupers, electric rays, guitar fish, hogfish, black coral, gorgonians, cushion starfish, parrot fish, trevally, grunts, yellow tails...Hard fast current 84 degrees Farenheit surface 72 at bottom." :Bob Defeo 2010. "Frogfish, sea lions, turtles, butterfly angel fish, lobsters, creole fish sargent majors, pilot fish, hard fast currents. *2 surface and 68 bottom temps." :Bob Defeo 2010. 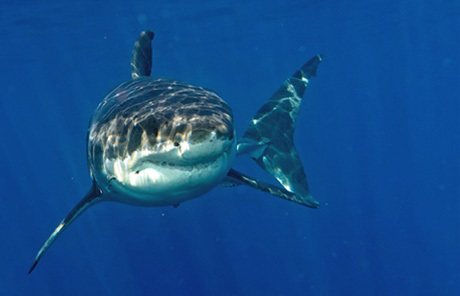 "100ft viz, huge great white sharks: a life changing experience getting to see a great white in person. " This archipelago is approximately 300 miles (500 km) south-southwest off the tip of the Baja peninsula. It comprises Socorro, San Benedicto, Clarion and the small Roca Partida islands. The islands are volcanic in origin. Annual rainfall is scarce and takes places mainly during August to October. The average water temperature ranges from 22oC in winter up to 29oC in summer. 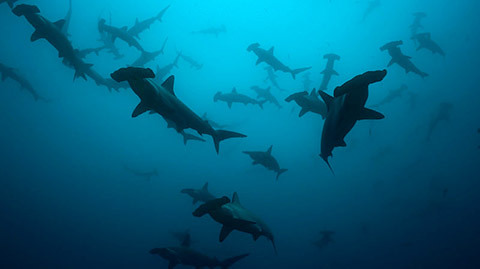 The best time to visit Socorro and the other Revillagigedo islands is between November and May. In 2016, UNESCO designated the Revillagigedo archipelago as a World Heritage Site. Like The Galapagos, the islands are at the meeting of cool and warm currents. This creates upwellings of nutrient-rich water which supports the excess of marine life. This year the Mexican government started a public consultation which it is hoped will lead to marine park protection of the area. "Fantastic diving with Giant Pacific Mantas, dolphins, shoals of jacks, white tips, moray els, octopus packed in a small area." "Giant pacific mantas, not reef mantas like everywhere else. Friendly wild dolphins. sharks galore." "Unbelievable encounters with Giant Mantas at a cleaning station. The mantas "dance" for patient divers." "Fantastic big fish action; sharks, sharks, sharks "
"Amazing sharks and large pelagics congregate at this spot." "Oceanic dives on pinacles or rock tips that drop to 150ft. Many pelagics, sharks - tigers, hammerheads, silky etc, mantas, clear water, very remote island. " This guide seeks to be a standard resource for divers and snorkellers - popular and scientific coverage of regional fish fauna. In 1940, Steinbeck and his friend, biologist Ed Ricketts, ventured into the Gulf of California to search for marine invertebrates along the beaches. This exciting, day-by-day account of their trip, is a wonderful combination of science, philosophy and high-speed adventure that provides a fascinating portrait of Steinbeck and Ricketts. John Steinbeck based his novel The Pearl on a story he heard whilst visiting La Paz in Baja California. "Hi, I'd recommend adding to your fiction section Peter Benchley's "The Girl of the Sea of Cortez." It is a wonderful book with great descriptions of underwater sealife, wise thought on living more in harmony with and understanding of the natural world, and a little bit of adventure to boot." Please add your comments on diving in Baja California, or anything else on this site. 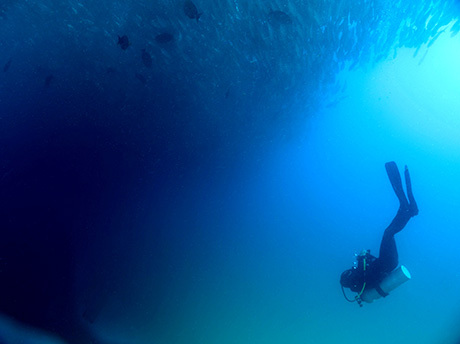 What Baja dives have we missed?